It's such a cool and blustery day in our neighbourhood that it's hard to imagine just a few weeks ago we were enjoying a warm summer afternoon in the English countryside. Where we sat in a garden drinking tea and deciding which homemade layer cake to try: Victoria Sponge, Coffee Walnut, or Chocolate Fudge. They all looked scrumptious, but I finally decided on a slice of Victoria Sponge cake. And, like Queen Victoria herself, I was smitten from the first bite. The cake was a sponge cake in two layers. Not too sweet, but with a filling of raspberry preserves and, I think, butter cream; it was so satisfying and delicious. For the rest of our trip, I was ever on the look out for Victoria Sponge at the tea shops. Truth be told, none met the mark -- some were too dry, some too sweet and jammy, and others bland in flavour. You'd think I was a judge for The Great British Bake Off. "Victoria sandwiches, or sponges, were soon all the rage, and eventually became the measuring stick by which the home baker was judged. And this is no laughing matter! The Women’s Institute apparently has strict guidelines on the “correct” way to make this cake, and it involves raspberry preserves and caster (not icing) sugar, and no buttercream." Rats about the buttercream ... to my way of thinking, the layer of buttercream in the piece I ate added a taste and a texture that was quite lovely. By the way, if you're wondering what castor sugar is: it is actually just a superfine granulated sugar, but not powdery like icing sugar. Apparently bartenders will use castor sugar in some cocktails instead of a simple syrup. Some of the other recipes I looked at use fresh whipped cream and fresh berries for the filling, but then that becomes more of a Victoria Sponge dessert. It would have been a bit of a trick for the Queen to hold her cake plate on her lap and safely maneuver a forkful of cake, cream, and berries into her mouth without something landing on her person. Let's just say, she would not have been amused. 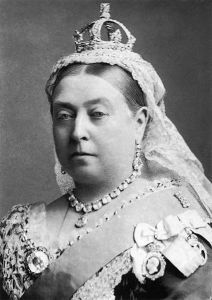 Referring back to Abigail's post, she includes some interesting background info, as well as the recipe and a short video on how to make a Victoria Sponge cake, dessert style. It looks easy enough, but there is a bit of technique. Click HERE for the post and video. And, since we already mentioned The Great British Bake Off TV series, I'm also including a link to Mary Berry's website, where you will find her recipe for Victoria Sponge cake. Not to mention lots of other nice recipes to make your mouth water. Aside: if you need a recipe using cups and teaspoons rather than measurements in weight, here's one at allrecipes.com. I have yet to try one of these recipes but there are a few September birthdays coming soon, so I'll have the perfect reason to spend a morning trying my hand at it and then sharing the results with family and friends for afternoon tea. Whether you decide to make a true Victoria Sponge or one of its variations, they all look scrumptious. Why not pick one and try it out? On that note, I'm wishing you a beautiful day. Hopefully there's a little cake in your pantry to sweeten your afternoon tea. Victoria sponge cake is indeed a treat although I've never eaten it with buttercream in it. Nor raspberries. It's always been with whipped cream and strawberry jam. But now you've got me wondering what the buttercream and raspberries would be like. Scrumptious, no doubt! Thanks for a delicious and fun post. I was happy to see Nadia win the Great British Bake Off, she was a consistent, problem solving baker. I make Bernideen's (Bernideen's Tea Blog) sponge cake but I may give the Allrecipes version a try too. Mine has a layer of jam and whipped cream in the centre and always made with strawberries. It is a delicious cake and I hope to find it on the menu of a few tea rooms here. I'm for trying buttercream in the centre as well. How delicious looking! 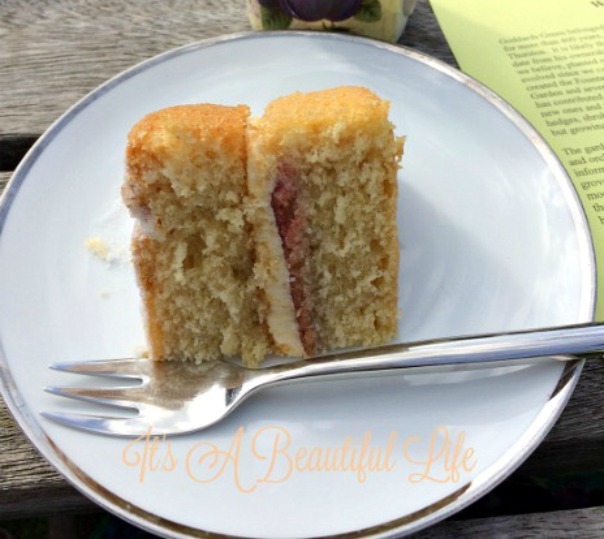 I don't know that I've ever had a Victoria Sponge, but your post has me wanting to try it. Just lovely! Oh Brenda your pictures and description had my mouth watering. This certainly sounds extraordinary. May just have to whip up one of these cakes. Take care and have a blessed weekend. Hugs! My one true weakness... Sounds so delicious and especially so with the buttercream. Fun post! 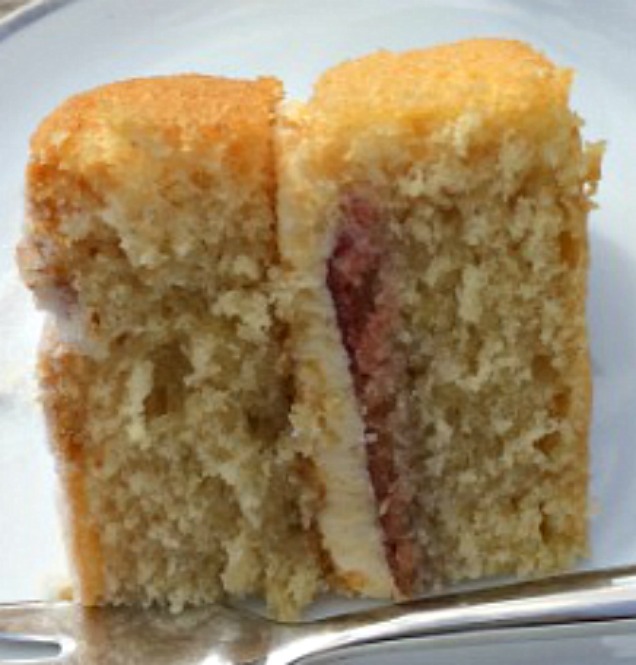 Even though I have never had Victoria Sponge, your post makes me want to try it. The idea of Rasp. preserves and butter cream sounds wonderful. I love cake! You are so lucky to have had your first bite while in England. I love your quotes! 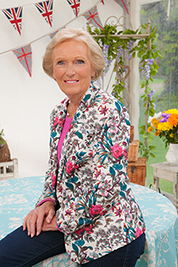 Not sure Mary Berry has me convinced on the healthiness of cake -- although psychological healthiness, yes. Making two cakes today for a fundraiser. They will involve sponges and whipped cream, jam, and lots of berries. Too bad I won't be having a piece!! !